The Bering 70 is the debut model for Bering’s Yachtship series. Like all of Bering’s models she has been designed from the keel up to be a superb oceanic travel and ideal for extensive coastal cruising. Her hull shape and profile let you easily recognize that the Bering 70 is an atypical motor yacht that is incredibly stylish. A reverse-raked bow is seldom seen in yacht designs of this size. The absence of a large overhanging bow means that there is less reserve buoyancy to create lift when making contact with an approaching wave. This in turn leads to the hull “slicing” through waves as opposed to riding up and over, thereby dampening pitch at sea. The end result, a smoother ride for everyone on board. 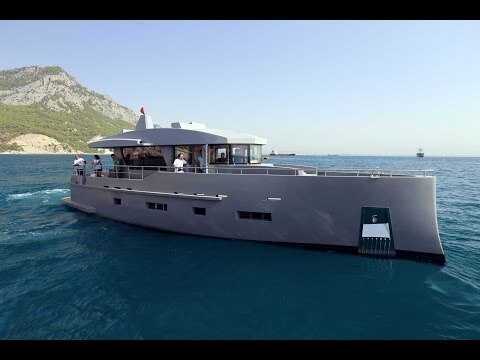 Similarly, her contemporary interior design is a departure from the more traditional styling found on many of today’s long distance motor yachts, but her capabilities are that of a true blue water traveler, with a range of over 2,500 nautical miles.